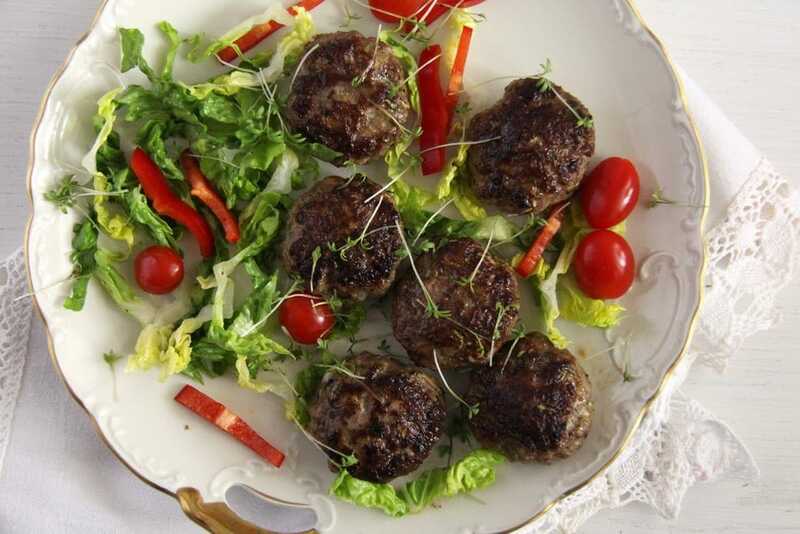 This is a Romanian recipe with a German touch. And the German touch doesn’t come from my living in Germany right now, but from the Transylvanian Saxons who have been living in Romania for centuries. The first colonists of German origin started arriving in Transylvania about 850 years ago. Many of them were searching for a better life than the one they had in their homeland and were hoping for more freedom and rights in the new territories. In a relatively short period of time they grounded a number of communities, which developed to towns over the years, towns that still exist today, for instance Sibiu – Hermannstadt (my hometown), Sighisoara – Schessburg, Brasov – Kronstadt, Cluj-Napoca – Klausenburg and so on. All of these are absolutely wonderful medieval towns and if you ever visit Romania make sure to visit some of them. My special recommendation is, of course, my hometown Sibiu, one of the most beautiful towns you can imagine, bursting with life and culture. Sibiu was also the home of the largest number of German ethnics – Saxons in Romania. Unfortunately most of them decided to leave Romania for Germany again after the fall of communism, but their cultural influence on the town and life style will never be really gone. 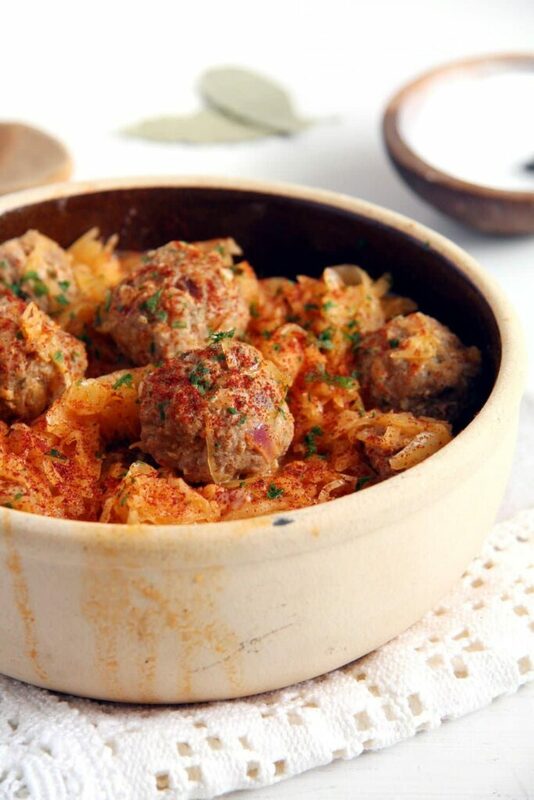 This dish – Stewed Sauerkraut with Meat Dumplings – is a dish of Saxon origin. 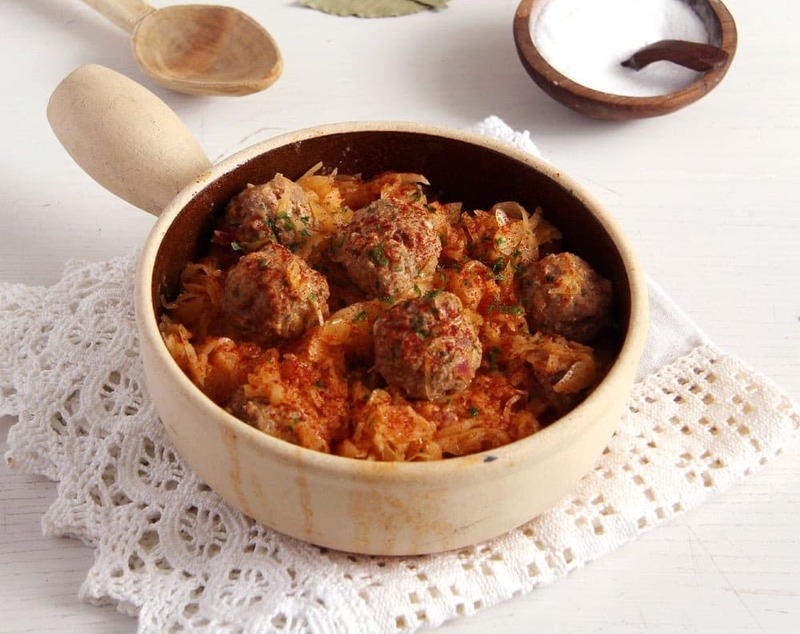 What sets it apart from a traditional Romanian recipe is the use of the wine sauerkraut, which is different from the typical Romanian sauerkraut. Romanian-style sauerkraut is not so easy to come by here in Germany, but good quality wine sauerkraut is more than available. I used to dislike German-style sauerkraut during the first years I spent in Germany. The main reason for this was that I liked Romanian-style sauerkraut way too much and I was so disappointed in discovering that the taste of the German sauerkraut didn’t have much in common with the taste I was used to. Romanian sauerkraut is more sour, robuster, has a stronger taste and comes in rougher pieces and I had found German sauerkraut to be too delicate, too soft, tasting of wine and sweeter that I was expecting it to be. However, over the years I’ve learned to appreciate exactly these qualities of the German sauerkraut, its delicacy, its sweet and sour taste, which makes it perfect not only as a side dish for many meat main courses but also for salads. 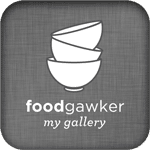 I really have to give you the recipe for one of my favorite salads made with wine sauerkraut and mandarins one day. Sooo good! 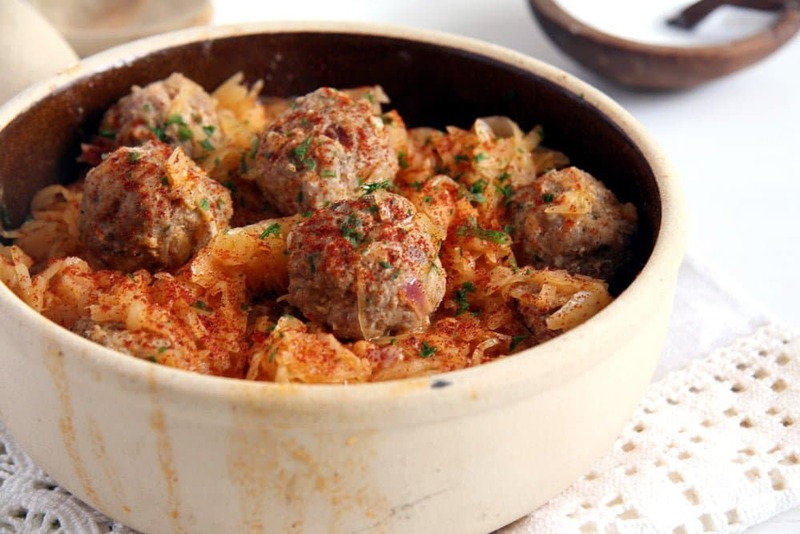 But until then, I hope you will enjoy this Stewed Sauerkraut with Meat Dumplings, a dish that I can only imagine eating in winter, something so full of taste and comforting, you will want to make it over and over again. I usually buy fresh sauerkraut at the butcher’s, it tastes amazing and 1 kg costs only about 1 Euro. However, canned is good as well, I use 1 large can of Mildessa sauerkraut. Soak the white bread for a couple of minutes in cold water. Chop the onions very finely and grate the garlic. Mix the ground meat with the chopped onions and the garlic. Squeeze the soaked bread and give it to the mixture. Add the parsley, sweet paprika powder, the lightly beaten egg, salt and pepper. Mix well. Make small dumplings, about the size of a walnut and set them aside. 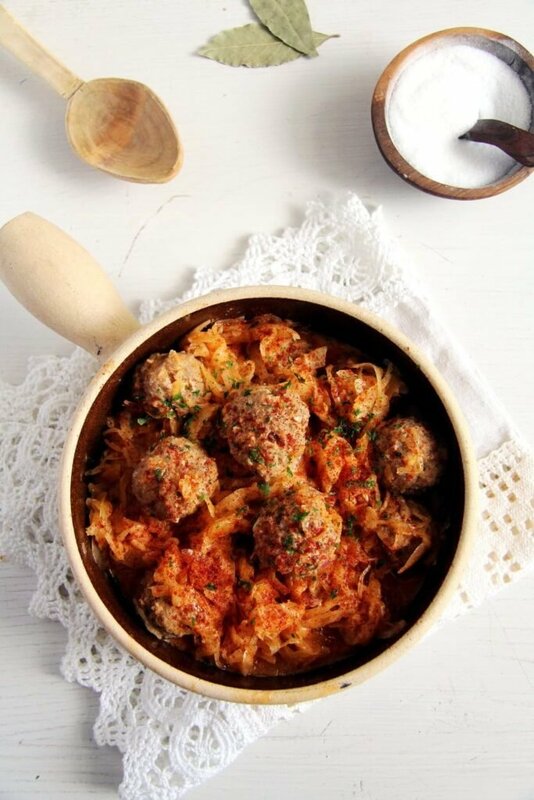 Place the sauerkraut in a larger non-stick pot or Dutch oven together with the tomato paste, bay leaves and sugar. Add enough water to almost cover the sauerkraut. Bring to a boil. Turn the heat down and add the meat dumplings. Cover the pot tightly and simmer everything for about 20 minutes or until the dumplings are cooked through, stirring from time to time and taking care not to break the dumplings. Add a little more water if you feel that too much of it has been cooked away. I added about ½ cup more during the cooking time but not all at once. At the end of the cooking time, at least half of the water should have been cooked away. In a small bowl whisk together the cream cheese and the milk until smooth. Make a bit of place in the pot by pushing away some of the meat dumplings and whisk in the cream cheese mixture. Stir carefully with a wooden spoon to assimilate the cream cheese to the sauce. Adjust the taste with salt and pepper. Serve hot or reheat before serving. You can serve it with white bread (like most Romanian people do) or salt potatoes (like most Saxons do) and with crème fraiche or sour cream. 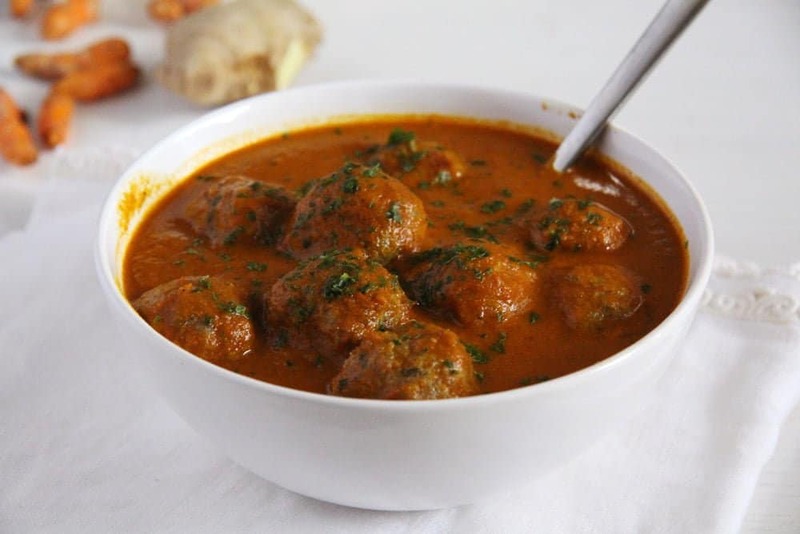 Hearty, comforting and very tasty! Yummy! I think I might come live at your house. No one in my family likes sauerkraut except me. I quite crazy about it but never had it with meatballs. Sounds delish! I love sauerkraut and dumplings, but I’ve never had them together before like this. Looks AMAZING! Those meat dumplings are totally calling my name! Comfort food heaven! Cheers! How well I understand you… Sauerkraut is so different in every country, isn’t it? I miss so much Polish sauerkraut which is also much stronger and more sour than what I find in Switzerland. The German sauerkraut I buy in the German organic shop (I always bring a dozen jars in our car) is a bit closer to the Polish one (the Swiss one is hardly sour), though still more delicate… maybe in Germany the taste of sauerkraut depends on the region? There is no mention of wine on my German sauerkraut. 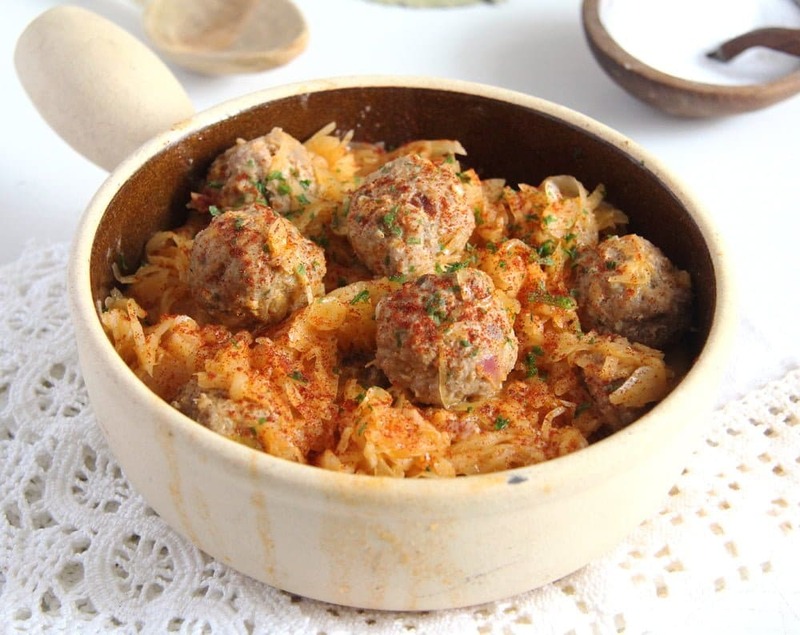 This dish looks fantastic and makes me year for well-seasoned cooked sauerkraut meal!